Pinterest Pin #10 (above) – I wore this outfit on a trip to Vermont last year! I’m excited that off-the-shoulder sweaters are still “in” for this year. Also, I keep my white jeans in rotation all year long so you’ll find me wearing them during the fall and winter. Pinterest Pin #9 – This one was also taken in Burlington, Vermont (one of my favorite little New England towns!). This outfit is easy to recreate with a cute poncho, white tee and jeans. Pinterest Pin #8 – I wore this outfit on a family trip to Connecticut a few years ago… ripped skinny jeans and a cute scarf make an easy and foolproof outfit combo for the fall. Pinterest Pin #7 – I still love this outfit so so much! And an identical plaid scarf is being sold this year- snag it while you can! Pinterest Pin #6 – Winnie totally steals the show in this picture (one of my favorites) – look at her little tiny body and white paws! This was taken only a few weeks after I’d gotten her. Pinterest Pin #5 – This completely grey and white outfit is super easy to re-create, and can be worn well into the winter. white jeans // Stuart Weitzman Highland boots, similar HERE & HEREPinterest Pin #4 – Another one of my favorites (fingers crossed they bring back the scarf this year). My mom and I road-tripped all the way to Manchester, Vermont last year and this was a cozy and comfortable outfit for the car ride! Pinterest Pin #3 – Taken right outside of my apartment in Winston, I wore this outfit on a fall day last year. Every woman needs a camel cardigan in her wardrobe, and leopard heels are the perfect way to add some interest and a subtle pop of pattern. Pinterest Pin #2 – One of my oldest fall outfits, but one of my most pinned of all time! I absolutely love the striped turtleneck paired underneath the chunky knit poncho – can there even be a better combination for fall? Pinterest Pin #1 – With almost 300,000 pins, this is (surprisingly) my most pinned picture on Pinterest! And my exact green tunic is still available online (and on sale!). 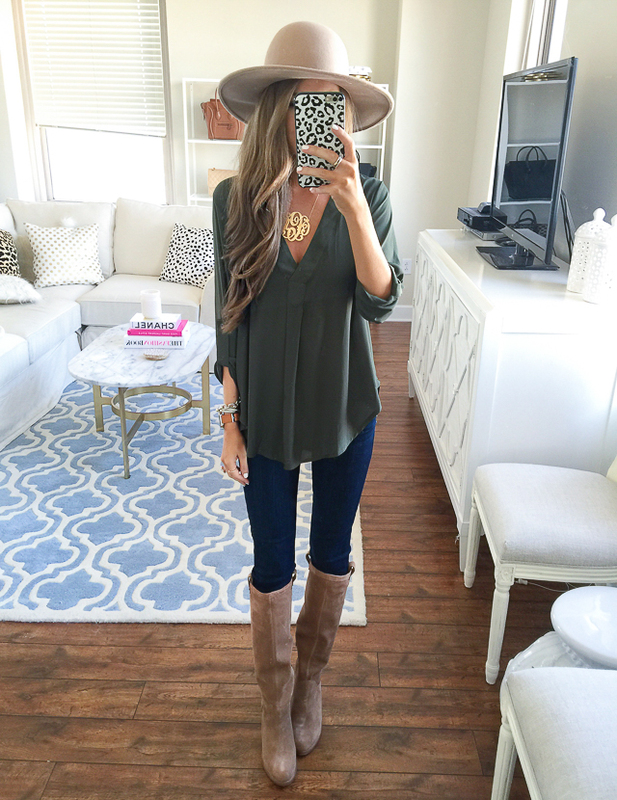 exact green tunic // Paige skinny jeans // similar boots // Hinge wool hatHappy Fall, y’all!!!! In love with all the tasteful fall looks! So basically comfy sweater or comfy scarf. All are perfect. No question why they are the most pinned! Give me all the scarves and ponchos for the fall! Loving these looks! LOVE them all- I think Fall fashion is my favorite and you always look so cute. Love the poncho in #2! What I love about all these combos is that they're all classic – they stand the test of time! You look so gret for fall! Really amazing! I love all of these looks! The brown skirt is one of my favorites. These are so cozy and fall-like, yet so fashion forward! Ah so fun to look back on your looks over the years! Your style is seriously sooo perfect! I love that fall fashion is so timeless, you can't go wrong with sweaters and scarves! #1, #2, #3, #6 and #8. Those are my absolute favorite! Number 2 is my absolute favorite. It's the picture that made me find your blog! Also a huge fan of 7. I used to have a skirt just like that and I've been on the lookout ever since. 1,3 and 4 are my favourite ones! All such cute looks for fall! It always surprises me to see what my most pinned content is! These outfits are all so adorable. I think the #2 is my fav. 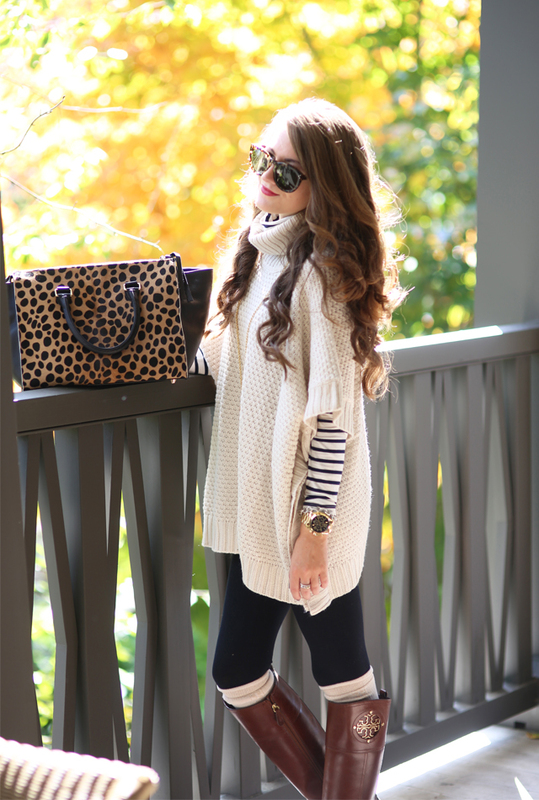 Gotta love a stripe turtleneck! I love all the off the shoulder sweaters! They're all my favorite! haha, I probably have half of them pinned! You always look beautiful! I absolutely love your fashion sense Cait! Your outfits look so flawlessly paired! I hope you've had an awesome Monday! I loveeee all of them! Especially number 7. You have the best style. http://trendkeeper.me .. STYLECON DALLAS VLOG! Love all of these photos and I can totally see why they're your top pinned post. They're my favorites too! I love all of these outfits especially number 6! Love all your fall outfits! The puppy dog pictures is one of the cutuest! What Is your lipstick color in #4?? Love the grey and white outfit! I've been a longtime lover of your blog but this is my first comment, I'm dying to know what brand/model the sunglasses you're wearing in #9 are. I don't know how to choose my fave!! I want all of them! I'll say #2 is my fave. Definitely love that look! I'm still so obsessed with the poncho/ striped turtleneck combo!! Oh and that leopard bag! I can see why these are pinned! They're so effortlessly fall I think everyone feels like they can relate and recreate them. Great picks, Caitlin!